This was only the first page, of which there were two or three of mixed drinks. Such an expansive menu might be intimidating for an inexperienced cocktail drinker, but I enjoyed the variety, and I thought the menu was well put-together. The Banyan is a great way to class up the much more ubiquitous strawberry margarita, and the pig rider presses the chocolate/tequila/chili pepper buttons that we all know and love. Alas, I did not opt for a tequila drink, though as I am writing this post, it would surely hit the spot. I would also like to call your attention to the tasteful inclusion of a variation of The Bitter End, a drink which appears in many different forms, but which always includes a float of amaro or aromatic bitters, so that the last few sips of the drink pack a substantial bitter wallop. Slice the lemons thinly, peel and all, and place them in a sealed container. Bruise the sage, and add it to the lemons. Cover the mixture in the sugar, and allow it to sit in a sealed container in the fridge for 2-3 days. Strain off the solids, being sure to scrape any undissolved sugar from the inside of the container, and add it to the vinegar. Bottle it, and allow it to mellow in the fridge for 2-3 more days. As the shrub sits, its flavors will harmonize and change chemically. Essentially, the vinegar pickles the syrup. If you added a few lemon peels to the bottled syrup, I wouldn’t blame you, but be careful, as they may overpower the relatively delicate sage flavor. Shake over ice and then strain into a tumbler full of fresh ice. Top with 1.5 oz ginger beer and garnish with a lemon wedge. Apologies to the Sexton if I got it wrong, but that’s how I would start. Before shaking, taste the mixture, and make sure that the flavors of the bourbon and the shrub are in harmony together. If the flavor of the shrub is not pronounced enough, add another quarter ounce. 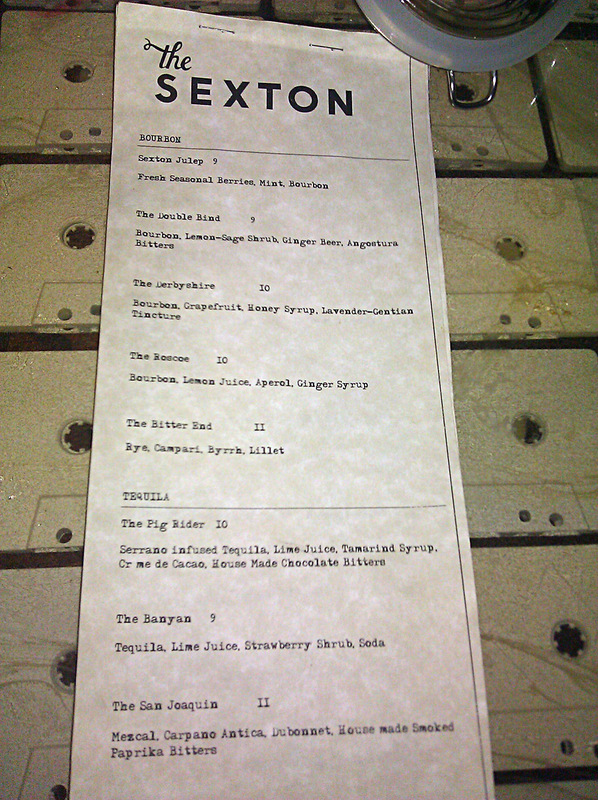 Many props go to the Sexton for using the appropriate amount of ice, and for crafting an interesting drink. I’m not sure how much of the sage I tasted in the instance of the drink that they served me, but the concept is very solid, and the flavor of the sage comes down to individual execution. They garnished the drink with a lemon wedge, but my inclination would be to use a toothpick to spear a sage leaf to that self-same lemon wedge, the more to convey the flavor of the fresh herb. 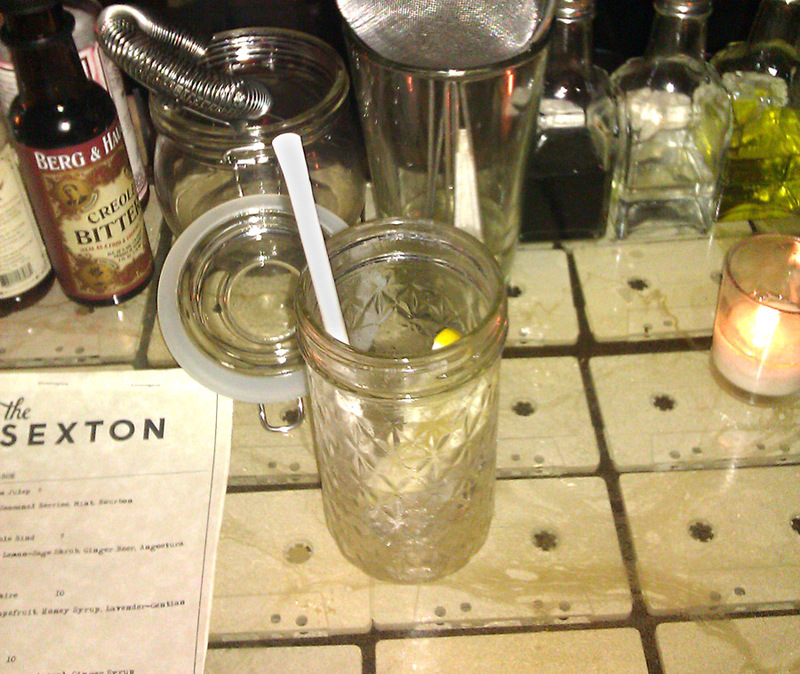 Categories: excursions | Tags: alcohol, angostura, Ballard, bitters, booze, bourbon, cocktail, cocktails, drinking, drinks, lemon, mixed drinks, mixology, Sage, shrub, shrub syrup | Permalink.